Parents often turn to their children for care and support as they grow older. Dawn Brown and her daughter, Dianne Jarvis, are no exception. Like any loving daughter would, Dianne is devoted to meeting every need of her beautiful, 86-year-old mum. However, there’s a surprising twist. Unlike those who reside with their elderly parents as fulltime carers, Dianne doesn’t live with her mum. Yet they spend most of their time together under the same roof at Peninsula Villages on the NSW Central Coast. Dianne has worked in the Leisure and Lifestyle department at Peninsula Village at Umina Beach, for the past 11 years. Dawn was happily living in the same suburb in October 2017, when her husband and Dianne’s dad, Joe, passed away. The couple has been married for an incredible 68 years. Joe’s death was devastating for Dawn. Wedded to her only love since she was a teenager, Dawn found herself alone for the first time in almost seven decades. Over that time the couple had achieved some impressive feats; running a series of small businesses while raising eight children. “And the loss I felt when Joe passed away was made harder by the fact we also lost our eldest daughter, Caroline, in the 1977 Granville train disaster,” Dawn said. “It was a very difficult and uncertain time,” added Dianne. Luckily, Dawn had Dianne to guide her. “Working at Peninsula Village for over a decade, I know the place inside and out,” Dianne said. “I’ve watched so many people come and live here happily because the standard of care, hospitality, social aspects and camaraderie are second-to-none. 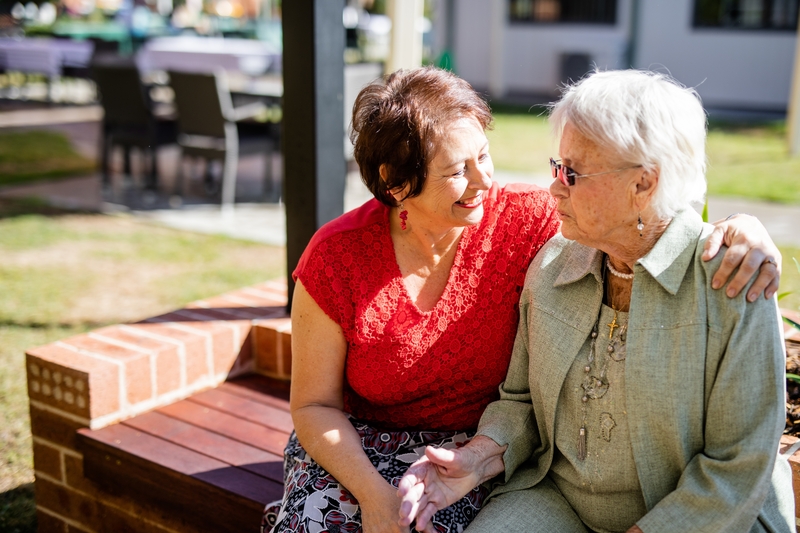 “That sense of community spirit is what mum needed, especially after being left alone for the first time in so many, many years,” explained Dianne. With the support of her children, Dawn made the move into Peninsula Village, where she has quickly embraced living within the Villages’ residential care facility, Pam Palmer House. “I love the activities, and the care and food are wonderful,” Dawn said. “But the highlight is getting all the benefits of being near my daughter, Dianne, who is absolutely amazing in how she supports me and the other residents. She absolutely loves running all the wonderful lifestyle activities throughout the Village including exercise classes, colouring in, music therapy and much more. Dianne makes sure to see her mum socially on every lunch break. “She’ll always let me know if I’ve got lipstick on my teeth – some things never change!” Dianne laughed. To experience the Peninsula Villages difference for yourself, book a tour today of the residential care and independent living facilities available. Phone 4344 9199 or visit peninsulavillage.com.au.